I'm now old, but I have something new ... stoked! Carrie and I are now the "2 Live Crew" on the "Axl Rows" squad. Or are we Milli Vanilli? I grew up in the 80s. Shut up. That's right - we are going to learn how to "crew" or "row". Whatever they call it. Starting September 9th and 10th through October 26th, Tempe Town Lake will host a 7-week rowing league that introduces rowing to new participants, teaches the basics of the sport, and allows rowers to show off their skills in a league championship regatta (on October 26th). It's two nights per week for the seven weeks. It will be a good shift in the workout routine. This is another one of those things that I've always wanted to try -- so here we go. The recovery from the Pikes Peak Ascent went well. I also turned 40 years old on the 23rd. The recovery from my 40th birthday "calorie fest" was a little tougher than the Pikes recovery. I now remember EXACTLY why I changed my diet habits. I hadn't really pigged out like that in a couple of years. Sure, I have not made ALL the best diet choices along the way ... but this was near gorging. Mass quantities of nachos and cookies do not make for a fun 24 hours. I am happy I finished. 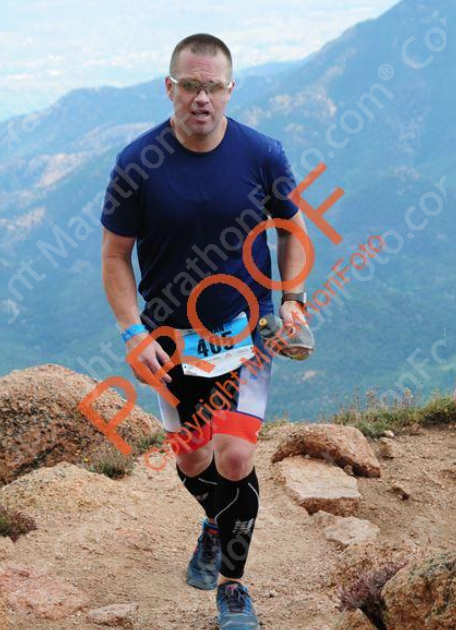 This race is such a challenge that I now know about where my upper limits of performance lie. I predicted a 3:30 finish time. I finished in 4:40. Since this was my 40th birthday present to me - I am reading my time as "For Forty." To say this was "fun" is a stretch. It was interesting. Mile 7: Another fun mile. I was passing people and pretty much ran the whole mile except when the trail narrowed and a small waiting line would form. Most of the climbing in this mile was near the end - and it got steep. 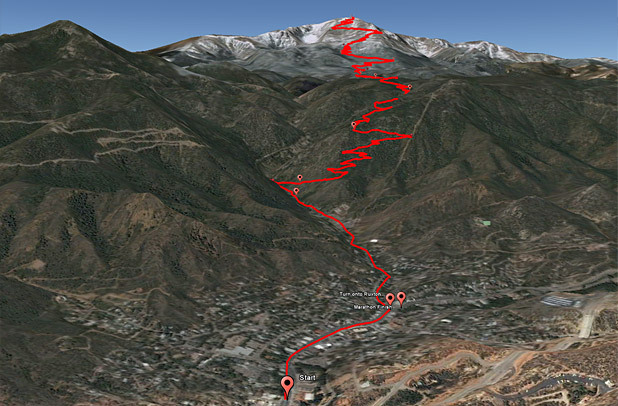 (295 feet of climbing). If I look more closely at this from a different perspective, I am happy. I was in Ascent - Wave 1. 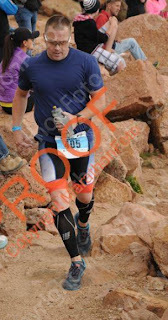 All of the people on the trail for the Pikes Peak Ascent are hard workers and gifted runners. I am glad they have the qualification restrictions - if nothing else for some measure of crowd control. - Have run a marathon in under 3:45:00. It is crowded the entire time. I passed people. People passed me. In places the trail allows it ... in others you have to make it work. I guess I had envisioned sections where I would be alone in my speed or slowness. My moving time was 4:29:24 -- I stopped twice on the trail on purpose. The other stopping was waiting on the trail due to traffic. 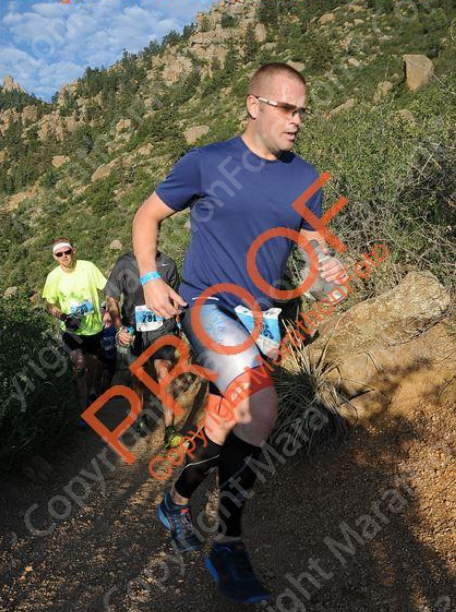 I was 102nd in my age group. I think there were 130 finishers. So that is the difference of being with a bunch of speed demons. I was 940th overall -which I think puts me somewhere near the middle of the pack. I can cross this one off my list. It was too crowded and a little stressful to call it fun. I am proud to say I finished the Pikes Peak Ascent 2013. So as hot as August is I am cooling the jets for a bit. I'll still be training - just not with as much intensity as I have for the majority of the year. 12 days from right now I will be about 50 minutes into the biggest running race of my 2+ year endurance journey. 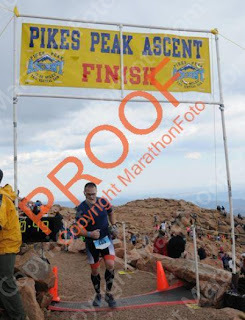 The Pike's Peak Ascent. Yeah, I know I have written about it all year. It's a big deal. It's a big deal physically as running uphill at altitude is about as challenging of an endurance endeavor as you will find. It's a big deal mentally. It's a big deal metaphorically. It's a big deal spiritually. After the race, I am sure I will have to write some lengthy mile-by-mile account that will only be for my therapy. The footing, or surface, of the trail does vary. In the forested sections it is primarily decomposed rock with a mixture of dirt and loose gravel on the surface with the occasional root or rock protrusion. Above treeline (that is, above the A-frame shelter) the trail is primarily loose gravel with one short section of broken rock (generally referred to as rubble) and the section known as the 16 Golden Stairs being gravel with frequent step-ups of some 10 to 15 inches (the Golden Stairs refers to the 32 switch-backs remaining to the summit). In general, the condition of Barr Trail is excellent thanks primarily to the Friends of the Peak and the Pikes Peak Trail Dogs led by Gail Allen. 1090 running miles - with a mix of Stairmaster, Trail Running & Treadmill. I have done very little "flat" or "street" running this year. I have run these 1090 miles with about 125,000 vertical feet of gain. I believe that calculates out to a 6 or 7 percent incline average on my runs. Is it enough? I hope it is. Okay. I am done talking about it until I finish it.